Leading Exporter of salt and pepper shakers, slant cut salt pepper shaker, rectangular salt and pepper pots and cylindrical salt and pepper pots from Mumbai. 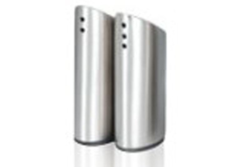 We are termed as the leading manufacturers and exporters offering an extensive range of Salt and Pepper Shakers. These shakers enhance the beauty of the dining tables. We manufacture our products using superior quality stainless steel that sourced from the certified vendors of the market. The manufacturing prices of our products are guided by the team of our professionals. We offer these products at picket friendly value. We are the most trusted name engaged in offering an exclusive range of Slant Cut Salt Pepper Shaker. Using superior quality raw materials we manufacture these products in compliance with the industry set standards. These are available in various sizes and designs. We offer our products at cost effective ranges along with customized service options. 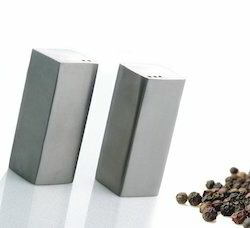 We are termed as the major manufacturer and exporters a wide range of Rectangular Salt and Pepper Pots. Using superior quality raw materials and advance technologies we manufacture these products under the supervision of our professional experts. These are available in various sizes and designs. We offer these are pocket friendly value along with customized service options. 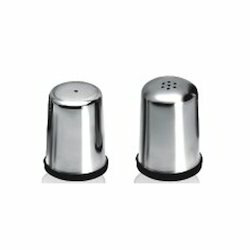 We are one of the well known company recognizes as a noted manufacturer, supplier and exporter offering an ecstatic range of When Cylindrical Salt and Pepper Pots used for spicing up the food on the dinner table, it enhances the beauty of the table and coordinates well with the environment. Available in various sizes and designs, one can purchase these from us at reasonable price range. 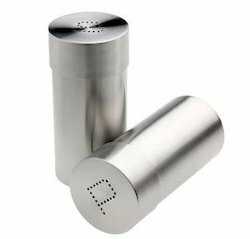 Looking for Salt and Pepper Pots ?